You know, if I was the kind of guy that pimped out his own firm’s newly redesigned website on a weekly community newsletter that goes out to over 1,000 people, I might include a link to the new FirstRound.com. 7PM NY Tech Meetup: FinTech and more! Back to demos. No choirs. We are pleased to have a member of our group and former product manager turned VC, Charlie O’Donnell speak to us about the challenges of job-hunting in the current market. 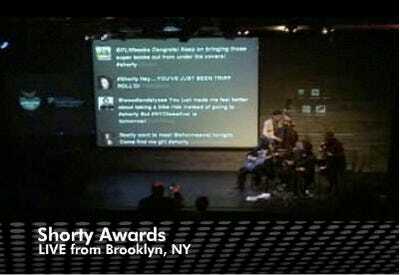 The Shorty Awards honour the best people and organisations on Twitter. These unique awards are for the Twitter community, by the Twitter community. Online voting is public and democratic, culminating in an awards ceremony that recognises the winners in 26 official categories as well as those in brand new crowd-sourced ones. Join us for a “Lab-themed” meetup: presentation and discussion with a team from technology consulting firm Lab49, which builds advanced solutions for the financial services industry. Kristie Weatherford will talk about her experience integrating Agile + UX for Lab49 and her previous engagements. Join four innovative investors in a conversation on the potential for private capital to have tremendous social impact. The event will feature a panel that brings together the nation’s most prominent advocates for both early stage investment and social enterprise–Fred Wilson, Jacqueline Novogratz, Roger Ehrenberg, and Jacob grey. Ladies and gentlemen, we are expanding! In nearly two years we’ve thrown seven Ignites for the technology communities in NYC. We are pleased to announce that our next event will take place on March 4th in Silicon Alley’s DUMBO, Brooklyn at the Galapagos Art Space. Legendary remixer Steve “Steinski” Stein, the inspiration for many recent artists including Girl Talk, will join producer Kembrew McLeod for the Q&A session after the screening. Code Camps are “grass roots” mini application platform developer conferences, free of charge to attendees and open to presenters of all stripes and experience. We’ve teamed up with the folks at the Roger Smith Hotel and the LAB Gallery in Midtown to put together 2 day’s worth of panels, presentations and case studies tackling the topic of social media for the arts.